Preheat oven to 375 degrees. Cook pasta to al dente according to directions listed on package. While pasta is boiling, in a separate medium saucepan over medium low heat, heat tomato pasta sauce, heavy cream, Romano cheese, garlic, optional red pepper flakes and season with salt and pepper to taste. Cook, stirring frequently, until cheese melts. Drain cooked pasta well, return pasta to pot. Add in grilled diced chicken, grape tomatoes, half of the mozzarella and half of the basil ribbons, then pour warm sauce over mixture. Toss to evenly coat. Pour mixture into a greased casserole or baking dish. 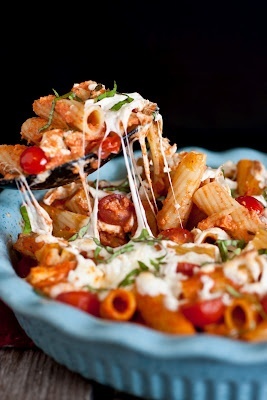 Sprinkle with remaining mozzarella and cook pasta uncovered for about 20 – 25 minutes until cheese is golden. Serve warm. *This was about 1 lb chicken. I placed the chicken in a ziploc bag then pounded each breast to an even thickness, then removed and sprayed each chicken breast lightly with olive oil cooking spray. I seasoned each side with salt, pepper and a light sprinkle of garlic powder. Then grilled them until cooked through, cut them in half thick wise (like cutting a bun), and diced them into fairly thin strips. **I’ve heard some people say they have trouble grating fresh mozzarella, I had no problem with this but if you do you can freeze it for 20 minutes prior to grating. They don’t need to be perfect shreds its really just to break it up.